You may have caught this post a few weeks ago when I originally shared it at I Heart Nap Time, but I wanted to be sure since it was the “cherry on top” in my outdoor living room reveal! If I could change the pinky beige color of my stucco I would, but for now I just have to come up with ways to make it work. 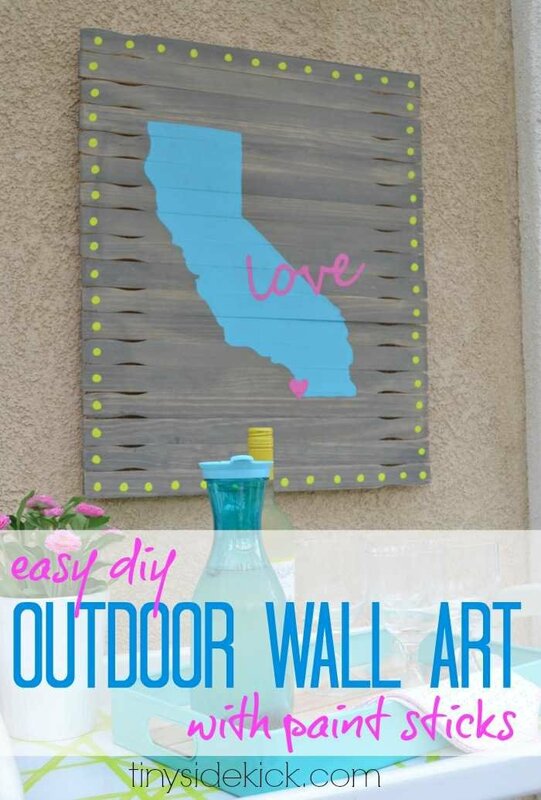 We spruce up the walls inside our homes with art, so why not take that idea outside too? Long paint sticks. I used the ones for the 5 gallon paint buckets. If you don’t see them out at the paint counter ask because they sometimes keep them behind the counter. Scrap wood as long as your paint stick canvas. picture hanging wire, or string. First I laid out the paint sticks good side down and with the notches alternating sides. Then I glued on some scrap pieces of wood to hold the paint sticks together and let it dry with a heavy stack of books on top. Once it was dry I gave it a coat of stain. I used MiniWax oil based stain in classic grey and let it dry over night. In order to get the outline of my state, I did a google search for “outline of California,” saved the image and then pasted it onto a word document. I had to do this twice dragging it to make it big enough and printed out the upper and lower halves of the state separately. Then I cut it out leaving most of the details out, taped it onto my paint stick pallet and traced it with a pencil. I painted in the silhouette of California with multi-surface craft paint. 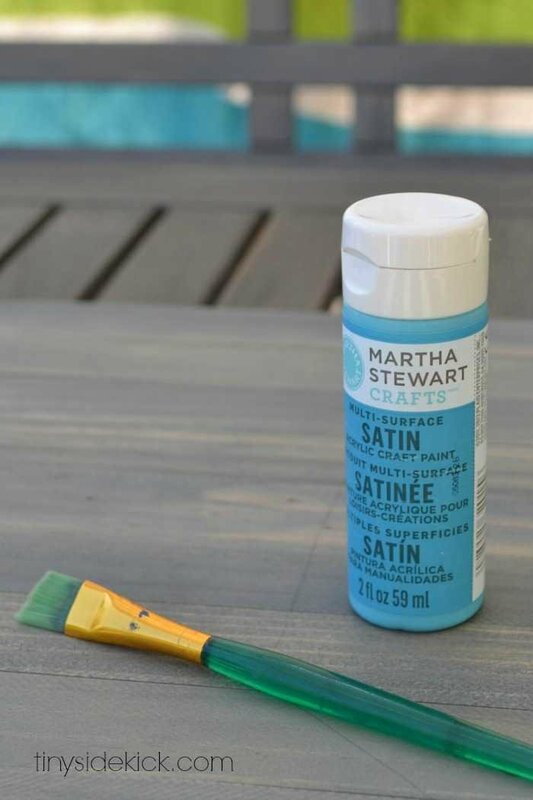 I like Martha Stewart craft paint because it is weather resistant. For my word I printed out the word “love” in a fun font. Then I covered the back side of the lettered area in pencil and found that the transfer only happened on the blue paint. So I went over it again with chalk and this time when I outlined my word the chalk outline transferred. Lastly, I used the eraser end of my pencil to make green dots all the way around my pallet. These bright colors tie into the fun colors I used on my drop cloth outdoor curtains and my outdoor drink station. Once it was dry I flipped it over and attached some wire with a staple gun between my two wood scraps. We used a masonry screw to hang it outside on the stucco wall. And that is it! It makes the perfect backdrop for our upcycled outdoor beverage cart that we just added and is such a fun addition to our outdoor space! Ooooo! So pretty, Corey. (And you can’t beat the price of supplies.) Thanks so much for sharing this at The Creative Spill on my FB page. *Someone” might be getting featured this Sunday…. Whoop whoop! I absolutely love this Corey- so fabulous!! The paint sticks are awesome…I have been toying with doing a ‘pallet’ with paint sticks too- they turned out perfectly. All your details to it are awesome, such a great outdoor art piece!! Pinned and stumbled…. Oh my word, Corey! I LOVE this! 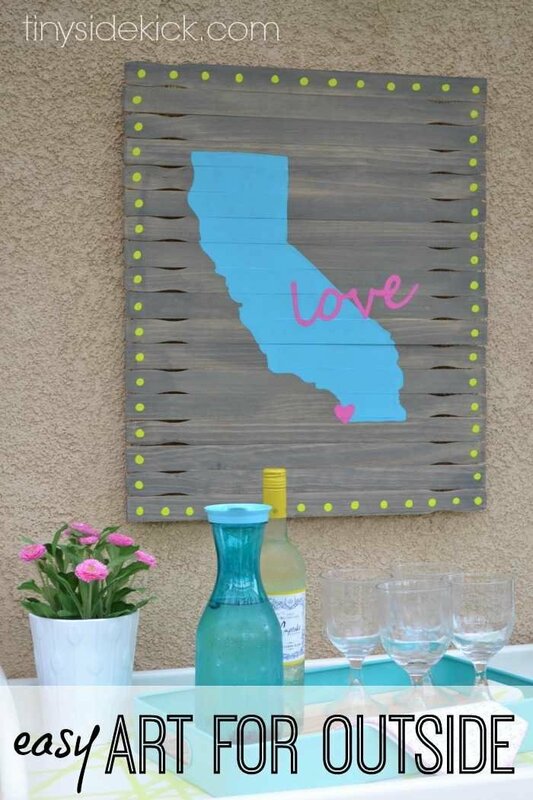 What a clever way to use paint sticks! And you can totally personalize this to any state although, I think I’d go with California too! !